Health and safety is a central and vital part of the belief view point for our company’s objectives. All our staff are fully aware of the health and safety requirements both on and off site. Health and safety in the workplace is the main objective for all our staff. This is to ensure everyone has a proper understanding of its importance. Our company safety performance is second to none and can hold its own on a statistical front with the best. The Management Team bears the responsibility for establishing, maintaining and implementing the safety system. Our efforts to ensure, through instruction, practical experience and training, that safety is the aim of all members of our team and that they have a proper understanding of the importance of the safety system function and its direct relevance. We encourage all members of staff to take part and help by having their say in the effort to eliminate accidents in the workplace. 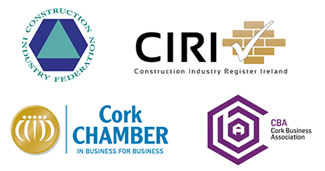 We are proud to be a part of Construction Safety Week with the CIF. Further details can be found in our company Health and Safety policy.